Marriage Licenses are issued by your town or city clerk on behalf of New York State, so any license obtained in the state is valid in New York City. The current fee for a marriage license is $35 in NYC and $40 outside of the 5 boroughs. WHEN TO GET A MARRIAGE LICENSE? No matter where in New York State you get your license, you must apply for it in person, together. THERE IS A 24 HOUR WAITING PERIOD from the time you receive your license to the time you may wed. Licenses are valid for 60 days before they expire, so plan accordingly. WHERE TO GET A MARRIAGE LICENSE? There is a New York City Clerk's Office in every borough where you can get your Marriage License. The City Clerk’s Office IS NOT OPEN ON WEEKENDS OR HOLIDAYS. 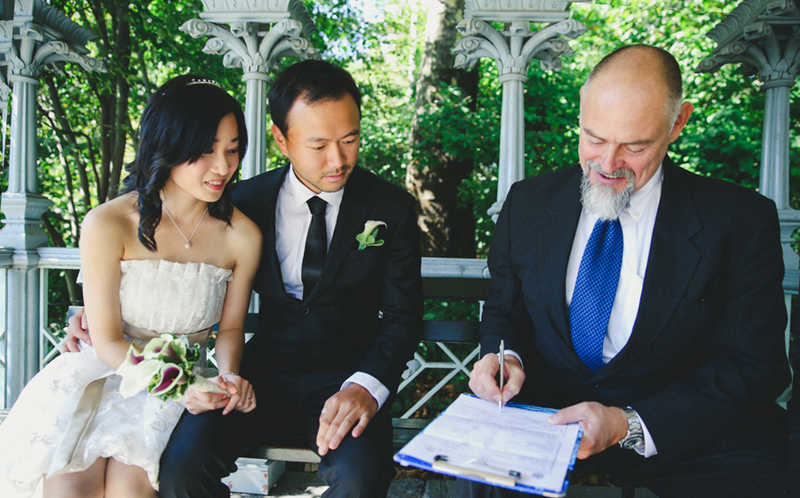 In NYC, you can apply for a marriage license online. You will still need to go to the City Clerk's office together, with valid identification, to complete the process. The online application is valid for 21 days before it expires. If you don't make it to the Clerk's office in that time, you can reapply online. We recommend that you take advantage of the online system, as our couples who have used it report speedy service from the Clerk. In neighboring counties, Town and City Clerk's office hours vary widely, some require appointments. Please check with your local government for locations and hours. Acceptable forms of identification also vary. You can find links to your Town or City Clerk's offices for Westchester, Rockland, Orange, Putnam, Nassau and Suffolk Counties here. HOW LONG DOES IT TAKE TO GET THE MARRIAGE CERTIFICATE? You will NOT receive a certificate of marriage right after your ceremony. Usually it takes about two weeks for the documentation to be sent to you from the City. If you need documentation sooner than that, you should discuss this with the Clerk when you apply for your License.